We're trying a little something new this month and sending out TLV on the weekend. We hope this gives you more time to peruse the newsletter outside of your busy workweek. As always, we hope you enjoy TLV and find it informative and thought provoking. We always appreciate feedback, so please don't hesitate to share it if you have it. We're also thrilled to bring you the TLV Entrepreneur Interview, a new section where we champion Houston's entrepreneurs and gain insights into their experiences and successes. In the summer of 2011, the Atlantic Monthly ran a cover story called "How to land your kid in therapy" that caused quite a stir. The article begins with therapist and writer Lori Gottlieb describing a pattern she noticed amongst her patients in their twenties and thirties. Over and over, she heard these patients describe a common emptiness and generalized anxiety. Yet by all accounts, their lives were successful. They had good jobs, nice salaries, nice apartments, great friends, relationships and - notably - great, supportive families. There was no history of depression in these patients' families. Why then, Gottlieb asked, did so many of these otherwise well-adjusted, successful people feel so miserable? As a therapist, Gottlieb had been trained to look to a dysfunctional family, or a problematic parent. So she was stunned to realize that what was going on here was the exact opposite: These patients' parents did too much for them. At large, the general emphasis on parenting in recent decades has been on rearing children who will become happy adults. If that's been a parent's objective for decades, what has shifted to create a generation of adults on Xanax? Gottlieb wonders if the shift has been in how we define happiness. It has become something we are meant to strive for of every minute of every day. Wait - happy every single minute of every single day? Sure, it sounds nice, but it also sounds...a little ridiculous for its lack of realism. Wendy Mogul, author of The Blessing of a Skinned Knee, cites that drama teachers struggle to find good student plays that satisfy the parents' demands for all kids to have an equal amount of lines. Red ink has been banned in many schools, for fear that the color can appear too "confrontational" and "threatening" to students. 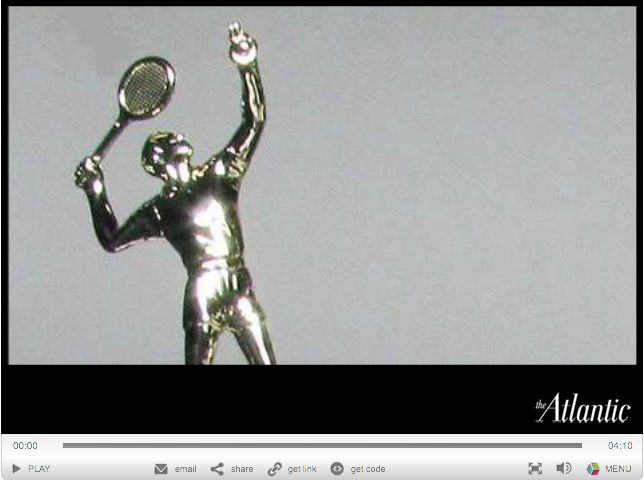 Many schools have instituted a policy where all kids on a sports team get trophies. A kids soccer league in Canada actually implemented a policy that if a team wins by more than five points, they will lose by default. "A" grades are now given to 43% of American college students, rendering this one-time indicator of excellence a joke. Kids today are often raised within an entire system that safeguards them against even a tiny disappointment at every turn. It begs the question: How can we raise happy adults if, as children, their expectations about the real world are never managed? How can one be happy if they have no coping mechanisms, let alone the awareness that there are coping mechanisms, to rebound from life's inevitable disappointments and frustrations? How can we encourage our children to take calculated risks and stretch beyond their comfort zones if we're forcing them to live in protective bubbles? How can they even recognize happiness if they have never been allowed to know its opposite - hardship? Furthermore, if we will go so far as to create fictionalized worlds for our children where failure is impossible and disappointment can't exist, what does this say about our own relationship with failure? Let's protract out this discomfort with failure and suffering. Look at the measures we took to save the too big to fail. Look at the taxpayer money we poured into companies that have run their course - as all things eventually do. Look at all the homeowners we bailed out from loans they shouldn't have taken in the first place. When did we all get so afraid of failure? When did hardship become so unpalatable that we will go to any length possible or pay whatever necessary to avoid it? It's very easy to romanticize the past, especially one we did not live. But one can't help but long for the perspective we Americans once had. One could say that perspective built this country - perspective about what a lack of freedom means, about what poverty looks like or how hardship feels. When our national experience began to turn towards prosperity, we recognized and appreciated it because we knew its opposite - suffering. Have we had prosperity and ease for so many generations that we've lost perspective, seemingly to a point where we're afraid of what a little suffering will do? (If it doesn't kill us, doesn't it make us stronger?) We coddle our children and the government coddles us so we don't have to feel an ounce of pain. Shouldn't we consider the effect a systematic avoidance of failure will have, no, is having on our society-at-large? Never mind that it is unsustainable. We're so far removed from suffering, we've got a generation on our hands that can't identify happiness and comfort even when it's surrounding them. While no one wants to make the people they love suffer or wish failure upon them, perhaps it's time to step back a bit when they do fail and allow them to find the confidence and resilience to recover. Gottlieb shares this example: When today's parents see their three-year-olds trip and fall, they immediately rush to them to comfort them, denying their kids a lesson in resilience along the way. Instead, they should give their kids five seconds to reflect on what happened, recognize their pain is circumstantial, then get up and discover their ability to bounce back. On a micro level, failure and its consequent suffering are a moment; resilience is what endures - when we allow it. On a macro level, failure and hardship are literally what inspired, motivated and built our country and carried us to success. Doesn't that make struggle a thing worth honoring? Read below for this month's section in praise of failure. "Negative results are just what I want. They're just as valuable to me as positive results. I can never find the thing that does the job best until I find the ones that don't." Too big to fail, too little to fail. That seems to be the economic policy coming out of Washington these days. Failure is just not an option. The whole concept of equal opportunity seems to have morphed into equal outcome. If any outcome isn't as good as another, then there must be something wrong with the system. Or, the more successful outcome must have come from someone who took advantage of the system, who gamed the system, who had more and better resources to engage within the system. The theory of creative destruction (Joseph Schumpeter, 1883-1950) suggests that new, superior innovations necessarily cause the demise of older, no longer efficient innovations. This creates a sort of economic survival of the fittest, where failure is a pivotal part of innovation. As hard as we want to try, as hard as we want to believe, there is no possible way to ensure that all outcomes of every effort, individual or collective, produce front end of the bell curve results. Developed market economies appear focused on ensuring that no one suffers any destruction, while destruction is a regular occurrence over in the emerging markets - allowing the stronger business models to weed out the weaker ones along the way. As we regulate away failure, might we also be regulating away success? The unemployment rate seems stuck around 8%. Okay, 7.8% to be exact. But what really is exact, when we have government bureaucracy measuring employment with all sorts of unique new processes and seasonal factors thrown in to determine "real unemployment"? The hiring market seems stagnant, save for the new oil & gas gold rush markets, where jobs are plentiful, earnings are booming, wealth is growing and housing is being constructed like crazy. Imagine what those college grads would think if they knew commercial welders with no college degree were making over $100,000 a year. A new industrialization may be coming to America no matter what the media and Washington worshipers care to believe. Natural resource markets are naturally growing jobs, wealth, waterfall economic activity and tax receipts. Guess what happens to the cost of government welfare when economy naturally grows? It's too bad our current President chose to avoid making any comment in his recent inaugural address about industrial policy that could stimulate more organic economic growth, which would translate into worthwhile job growth. Instead it appears we are poised to create more government, social services, restaurant and health care jobs. Now that's an economy to get excited about. The mean can only be calculated with data from both sides. There is no black without white. There is no good without evil. There is no resilience without failure. Don't be afraid to fail, and don't chastise those who do fail. What happened to learning from our failures? How can we learn if we don't fail? Experience is what you get when you didn't get what you wanted. Or another way of saying the same - experience is what you get when you didn't get what you expected. With enough experience, one might be able to garner a bit of wisdom. Hmm...Maybe it takes a reasonable amount of failure before one can really achieve wisdom. In 2012, the union membership rate - the percent of wage and salary workers who were members of a union - was 11.3%, down from 11.8% in 2011. The number of wage and salary workers belonging to unions, at 14.4 million, also declined over the year. In 1983, the first year for which comparable union data are available, the union membership rate was 20.1%, and there were 17.7 million union workers. Regional and state unemployment rates were generally little changed in December. Twenty-two states recorded unemployment rate decreases, 16 states and the District of Columbia posted increases, and 12 states had no change. As borrowed from the BLS's Business Employment Dynamics (BED) arm, which collects data around new businesses and company exits. Follow this link for a series of charts and analysis about entrepreneurship and the U.S. economy. 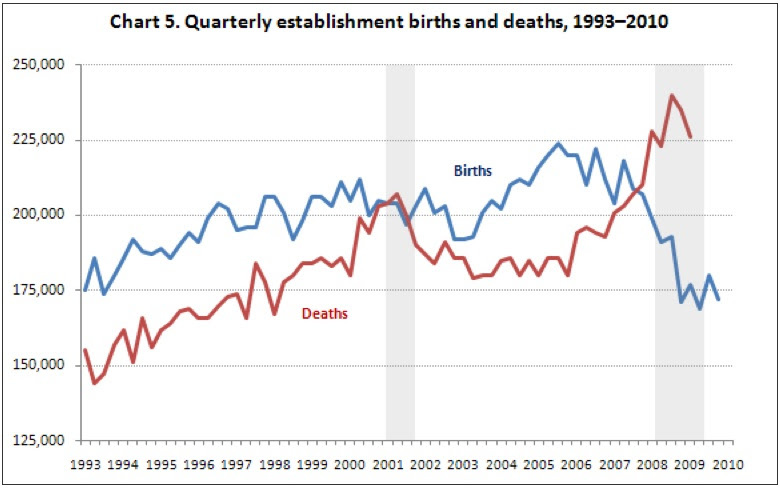 BED Commentary: "In addition to annual birth cohorts identified by age, BLS also publishes BED data on business births and deaths on a quarterly basis. The birth and death data series is the most timely source of data available on new private sector business establishments in the United States. 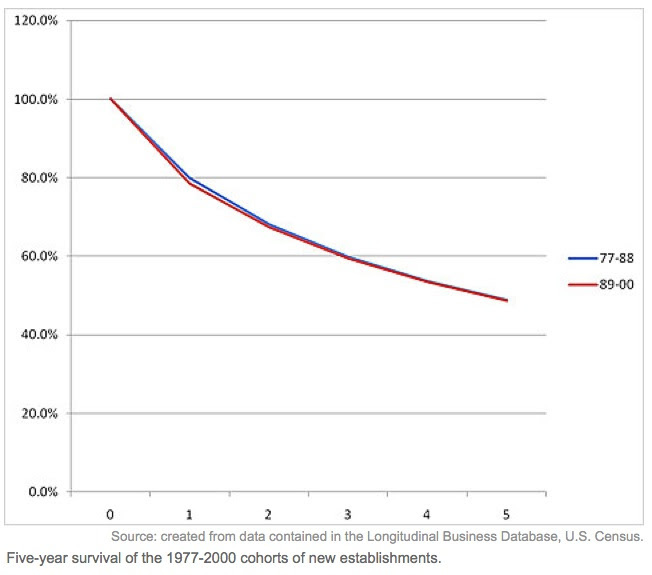 As shown in chart 5, the period from 1993 to 2006 was marked by an increase in the number of births and deaths, indicating a higher amount of business "churn"-that is, new business establishments entered and old establishments exited the economy in greater numbers. Since the most recent recession began in December 2007, births have experienced the steepest decline in the history of the series. New establishments are not being formed at the same levels seen before the economic downturn began, and the number is much lower than it was during the 2001 recession." Houston is not only an ideal environment for entrepreneurship, it is also a town of enterprising and innovative minds. We are excited to introduce the TLV Entrepreneur Interview, where we celebrate Houston's entrepreneurial spirit and gain insights from the people who drive it. In 2001, Steve Rosencranz launched The Woods Project, a non-profit organization whose mission is to empower low income youth through environmental education programs and wilderness trips. This is not Steve's first entrepreneurial rodeo; he previously founded two successful boutique finance companies. After a fulfilling career in the for-profit world, Steve felt ready to shift his focus from the bottom line to serving the community. The Woods Project provides opportunities for low income, disadvantaged high school students to develop leadership and teamwork skills by participating in school year weekend wilderness trips around Houston and summer weeklong trips as far as Glacier National Park. By way of on-site community service and team building exercises, students are encouraged to push both their physical and mental limits, always learning they are capable of more than they thought. Students of The Woods Project share inspiring stories of lives being transformed and bolstered confidence impelling better personal choices. By all accounts, Steve has been as successful in the non-profit world as he has been in the for-profit world, with many people benefitting along the way. TLV: What motivated you to start The Woods Project? SR: I felt it was time to focus on something besides money as a metric. I had reached that point personally after selling one business and then selling out to my partner in the second. Money is still an important measuring stick, but became much less important to me than being able to change kids' lives for the better. TLV: What is the hardest part about starting and running a young non-profit? SR: The revenue model in non-profits is a lot more complex than in the for profit world. Managing a revenue stream when the only incentive on the part of the "customer" is doing good, with no tangible return, is quite different than when the customer gets something tangible for their money. It's a different kind of sale. TLV: How do you find Houston as a home for this kind of start-up? SR: Houston is a phenomenally generous city with a lot of wonderful, entrepreneurial people. TLV: How long did it take you to get started? SR: Things just happen, there's no 'big bang'-we just started building, with the goal of getting better at what we do every day. Now we look at what we do and go "wow, where did this come from?" TLV: How do you balance the funding and operating challenges with your service delivery? SR: All non-profits dance on the knife-edge between Mission and Money. We work tirelessly to come back to the Mission Statement to ensure we're doing the right things. TLV: What is the most important thing you would like for people to take away from The Woods Project? SR: The widow's mite is a recurrent story. It's not about what you give, it's about the heart that the gift came from. I'd like people to come away with the contentment that comes from playing a part in changing the lives of low income youth. TLV: Where do you hope to be with The Woods Project in 5 to 10 years? SR: I hope to have an organization filled with passionate people who don't need me around. TLV: What do you need from other people to reach your goal? SR: Good hearts combined with good minds make for good outcomes. Some of our supporters are strong financially, some are strong programmatically - each is valuable in its own way. TLV: What advice can you give to aspiring entrepreneurs? SR: In my view, doing good is about achieving your mission, while doing well is about doing it in such a way that is financially viable and makes good business sense. You have to do both in order to have a successful non-profit! 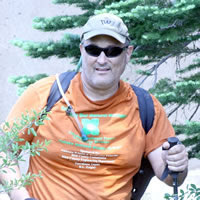 To learn more about Steve and volunteer opportunities with The Woods Project, visit www.thewoodsproject.org. This article looks at the many ways parents and schools collude to preclude kids from a millisecond of disappointment. Citing a school that issued "Honor Student" awards to every student, and public schools that only give out "As" and "Bs," the author says we've reached a level of self-parody. Yet the consequence is not humorous. All this coddling creates ego, the opposite of self-esteem, while discouraging real effort and hard work by teaching children it's not a prerequisite for success. Adults can also get seduced by an easy fix. For years, vanity sizing in fashion has made people think they're a smaller size than they are. Financial inflation caused the home values for millions of Americans to increase falsely, causing them to believe they could upgrade to that McMansion. We've seen how that lie came crashing down. So too will the lie that success can come without effort. Stanford psychologist Carol Dweck divides the world into those with a "fixed mindset" - those who believe their abilities are finite - and those with a "growth mindset" - those who believe they are in control of their success and can improve. The effect is that growth mindsetters see failure as temporary and something that can prod them to progress, rather than an indication of inherent limits. To encourage a growth mindset, praise the effort, not the ability. HBR offers five general tips for coping with failure in the workplace. A notable one: In the immediate aftermath of a failure, offer empathy before moving into problem solving mode. Doing so creates an environment of trust, which enables a healthier workplace as well as comfort raising red flags in the future that can prevent additional failures. "The road to success is littered with failure: Some of America's greatest inventors and innovators embraced failure as an important step in the process of developing a new product or service. The early-20th century CEO of IBM, Thomas Watson famously said, "If you want to increase your success rate, double your failure rate;" and before him, the great American inventor Thomas Edison said he never failed but simply proved approaches that would not work." "Removing the freedom to fail erases the incentive to succeed: Artificially preventing businesses from failing removes a critical element of entrepreneurial equation. Without failure, America's free enterprise system would be challenged to produce the products and services that have yielded America the highest GDP of any country. Without risk, competition, and the potential for failure, there is no incentive to invest in research and development, improve products or lower costs, which hurts commerce, trade, and economic growth." "America's business and investor culture forgives entrepreneurial failure: In many countries around the world, business failure is taboo and can mean the end of one's entrepreneurial career. Some countries in the European Union, for example, offer little forgiveness for entrepreneurs whose company fails. This is partly because the European venture capital market (which is small relative to the United States) focuses on profit over growth. A professor of entrepreneurship looked at start-up failure rates across industries and found a certain trend: 48.8% of the new establishments started between 1977 and 2000 were alive after five years. He found this to be true no matter if an economy was in a recession or not, debunking the notion that companies started during a recession had a higher survival rate. This fascinating article looks at why there is so little entrepreneurial activity in Europe. While there are myriad inputs, one of them is the stigma around failure in business. A study on the lack of entrepreneurship in Europe found that honest, failed entrepreneurs are often treated like fraudsters, holding them to debt for years or literally barring them from being able to attempt more entrepreneurial activity. While there are other factors, this sheds light on why so many aspiring European entrepreneurs defect to the U.S., where we have the freedom to fail. Read on for more insight into Europe's systemic hostility towards start-ups. A study conducted by the Global Entrepreneurship Monitor and Babson College puts American entrepreneurs among the least fearful in the developed countries. Less than one third of Americans claim that a fear of failure would prevent them from starting a business, and 55% say they have what it takes to start a business. Seeing failure as an opportunity to create learning and improvement, this HBR writer goes so far as to say that effective managers will seek out appropriate opportunities for failure, and then navigate through them strategically. The author cites innovation as an area that benefits from repeated failures, with the goal being "failing fast," meaning conducting rapid tests with low risk. He also says it's useful when there's a need for performance improvement. Pushing people outside of their comfort zones is a surefire way to develop their skills and confidence, and necessarily means some failures are inevitable, but worthwhile. Happy news for fans of fracking: The ever controversial, often misrepresented practice of fracking seems to be driving a dramatic dip in carbon emissions. According to a report, "U.S. energy related carbon emissions in 2012 will fall below 5,300 million tons or down about 12%, compared to the peak emissions of 6,023 million tons in 2007." No other country comes close to matching this decline in carbon emissions. KPMG put together the following chart ranking the highest effective personal tax rates around the world. 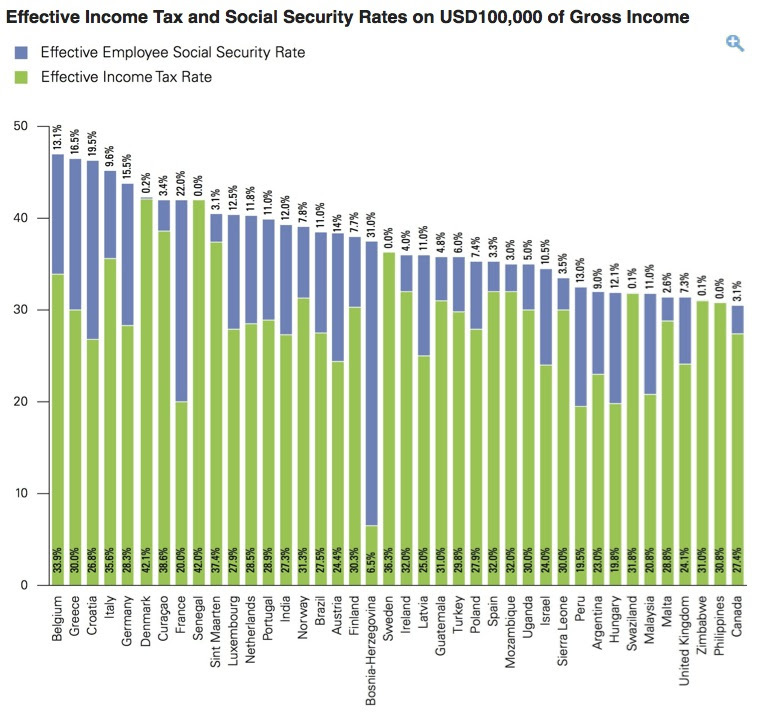 For someone making $100,000 a year, the chart shows the 40 countries where an individual would pay the most in tax and social security combined. Download the full chart to see the U.S., coming in as the 55th most expensive country for personal taxation. Decisiveness is a must-have quality for a leader. Making clear decisions lends to credibility and allows employees to take specific action and feel valuable. Inevitably, however, some decisions will prove to be the wrong ones. The other side of decisiveness requires being flexible, humble and comfortable with admitting mistakes. Transparency and honesty keep a team motivated during a strategic recalibration. This article suggests that no matter how well studied one is in leadership, these five common pitfalls can stall any leadership plan. To pave the way for your leadership strategy, first establish credibility and relationships with your team, unify your belief systems, align goals and incentives and communicate in their language. Read on for more detail. How can you be sure a candidate actually knows what he says he knows? Michael Mauboussin, author and investment strategist, explains the Behavioral Descriptive Interviewing technique. At large, the technique is meant to drill down to unearth the breadth and depth of a candidate's experience, knowledge and skills. 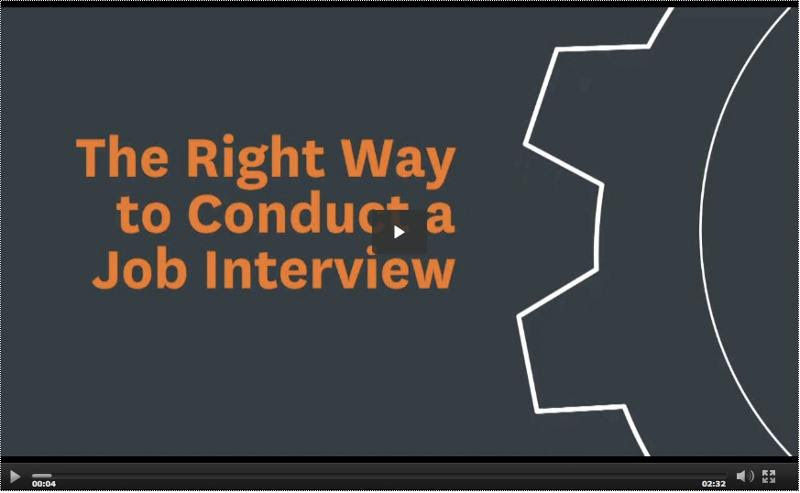 Watch the video for suggested tactics to this overall interview strategy. Everyone knows that a poorly run meeting is not only annoying, but also a waste of people's valuable time. Yet, when well run and efficient, meetings can be opportunities for problem solving and effective decision-making. Follow the link for five tips for highly productive and impactful meetings that won't leave your team feeling frustrated.